Come to beautiful Orlando and spend 5 days in the plush training center of Integrated Business Group (IBG). IBG is a Certified partner for Learning Resources and have the best classrooms I have ever seen. Comfortable chairs and lots of room to spread out! The Dexterity basics class takes you from opening the book for the first time to creating a small integrating application with Dynamics GP. It’s that time of year for another fun-filled week immersed in the world of Dexterity. For more information and to register call Roxanna Alvarez @ 407-677-0370 or e-mail her directly ralvarez@ibgnet.com. This class is very hands-on and starts at the beginning; no previous Dexterity experience is necessary. Customers or Partners who will be customizing or building add-on or standalone applications to integrate with the Microsoft Dynamics GP products. VSTools programmers who will need to design their windows using Dexterity instead of WinForms will also benefit from this training. You will learn how to create windows and also how to create Dexterity tables. A synopsis of the class is below this post. Dexterity Product Fundamentals will teach you about the development environment used to build the Microsoft Dynamics GP family of products. This course will provide you with the foundation you need to build integrated, database-independent applications. In addition, you will learn how to provide powerful application functionality for Microsoft Dynamics GP. Basic programming techniques used by Microsoft Dynamics GP to develop their core modules. How to modify existing Dynamics GP forms and reports in order to make customizations for customers. How to develop add-on applications that will interact with the Dynamics GP products to meet specific requests by customers. 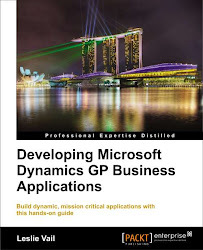 How to package and ship your dictionary allowing Microsoft Dynamics GP to make updates to Dynamics GP without affecting the developer's dictionary. How to register your product with Microsoft Dynamics GP using a unique Product ID to ensure no duplication of add-on applications with the same name. How to develop add-on applications that will "look and feel" like Dynamics GP and provide seamless interface between the applications to ensure a professional finished product. How to use object triggers, which are scripts in your applications that are invoked by events in Dynamics GP, allowing several developers to deliver enhancements to the same Dynamics GP form.